Non-medicinal ingredients: silicon dioxide, maltodextrin, microcrystalline cellulose, sodium stearyl fumerate. Capsule: hypromellose, chlorophyll. 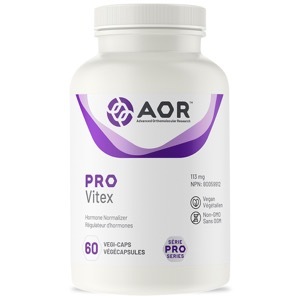 AOR's Pro Vitex contains chaste berry (vitex) extract combined with vitamin B6. This synergistic combination utilizes vitex's progesterone-increasing effect with the increased neurotransmitter synthesis of vitamin B6, helping alleviate some of the causes and symptoms associated with hormone dysregulation. This formula provides hormonal support for individuals experiencing symptoms related to imbalances in progesterone (indirectly affecting estrogen), neurotransmitters serotonin, epinephrine, and dopamine. Such symptoms include: premenstrual mood changes, hot flashes, anovulation, infertility, and polycystic ovarian syndrome. Pro Vitex may also be beneficial in weight loss and detoxification programs. Pro Vitex is formulated with a high dose of vitex, standardized to obtain the maximum benefits of the herb. Combined with vitamin B6, Pro Vitex offers a synergistic approach to relieving both physical and psychological symptoms of hormonal imbalance. Take 2 capsules once a day with or without food. Use for a minimum of 3 months to see beneficial effects. Caution in individuals taking hormone containing medication such as progesterone preparations, oral contraceptives or hormone replacement therapy (HRT). Reassess if symptoms persist or worsen.